When the PNM was in power, I was the President of the local chapter of the Global Organisation for People of Indian Origin (GOPIO) and an executive member of the largest and most powerful hindu organisation, the Sanatan Dharma Maha Sabha. I received numerous complaints of victimization and discrimination from members and was forced to take legal action on their behalf. I paid a dear price for this and, as the pressure mounted at the NLCB, I was forced to seek protection from the courts personally. Together with Chandresh Sharma, I filed many cases under the Freedom of Information Act and under the constitution for breach of the right to equality of treatment. In all these cases, external lawyers were retained by the state. It was clear that the work went to a small handful of PNM lawyers. It is a matter of public record that Anand Ramlogan fought and won all these landmark discrimination cases on our behalf. Strangely, there were no complaints back then. No one complained when the brother and husband of the Minister of Legal Affairs were being retained. And no one complained about their fees regardless of how high they were. Apparently, Ramesh Lawrence Maharaj had lost his voice then and he appears to have now lost his memory. 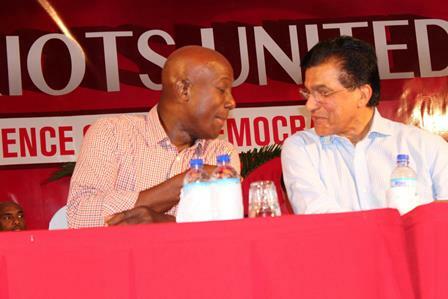 He is the latest attack dog and poster boy for the PNM and Rowley’s new tag-team partner. · The exorbitant fees paid to a small handful of lawyers who were invariably retained to represent the AG including Stuart Young and Michael Quamina, Ian Benjamin, Reginald Armourer SC and Douglas Mendes SC. · The high legal fees paid out in the Sat Sharma and Basdeo Panday fiascos. AG Nicholas has said the external lawyers retained by the state have been successful in 95% of the cases they fought. Under the PNM, this figure is probably reversed. I certainly won 95% of the cases I filed against the external lawyers Jeremie and Louis Lee Sing retained. The attack on the lawyers and Anand Ramlogan by Ramesh and Jeremie is malicious and politically biased. In the document laid in parliament, Stuart Young is listed as billing $440,883.30 in one case. Not a beep from Ramesh and Jeremie. The discussion on legal fees is biased. Fair and informed commentary must involve a discussion on the value of the claims against the state, the success rate of the attorneys retained, the amount of legal costs awarded in the favour of the state and the amount of money recovered. Ramlogan has spent millions to recover billions from PNM officials and Ramesh is a PNM political distraction with no credibility.